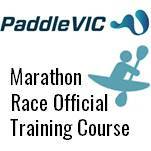 Paddle Victoria Marathon needs interested participants to become officials to assist in the successful running of state-level paddling events. What’s involved: Becoming an official requires completing on-line material, attending a half-day workshop and participating in on-the-job training. The training program is provided free of charge. On-line courses: The “Community Officiating General Principles” course covers ethical responsibilities of officials, preparing for officiating, safety and communication. The course takes approximately four hours to complete and is available via the Australian Sports Commission’s online learning portal at https://learning.ausport.gov.au. The “Play-by-the-Rules” courses cover child protection and harassment & discrimination and are available at the ASC’s online portal and at https://www.playbytherules.net.au/online-courses. Workshop: This workshop provides participants with the appropriate skills and knowledge to become an official at state-level marathon events. The course includes event scenarios and practical applications. Topics include race rules, procedures, scrutineering, roles and responsibilities, safety and risk management. The workshop will be held at a location and date to be determined during 1st quarter 2019 (most likely Saturday, 16th February, Saturday, 2nd March or Sunday, 24th March). Participants will be provided with a training pack covering the roles and responsibilities for each position and a copy of the marathon racing rules. On-the job training: This consists of shadowing existing experienced officials at one race, operating in an acting capacity at the next race (under the guidance of an experienced official), and operating as a full official at a subsequent race. After qualifying: Our expectation is that new officials would make themselves available to officiate at two or three events per year but are welcome to officiate at more events should they wish. “Officials” versus “volunteers”: Both roles are important to the successful running of our events. The distinction for our purposes is that officials staff the designated positions on the competition committee, such as Chief Official, Deputy Chief Official and Chief Course Umpire, and the Safety Officer role, while volunteers staff the Competition Manager, Registration, Finishing Line/Timekeeping, Turn Buoy and Portage Officials, Safety Boats, First Aid and other positions essential to the safe and efficient operation of events. We shall be organizing training for volunteer positions in the 2nd quarter of 2019. Please contact John Young (0417 444 350) or Joe Alia (0418 920 401) if you would like more information.